Northrn Ireland clasp. with fixing bar/pin. 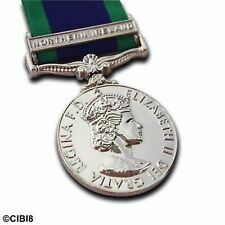 General service medal northern ireland. Wear with pride to support Soldier F. Condition is New. Dispatched with Royal Mail 2nd Class. Serving in the RAF. The recipient held the rank of Senior Aircraftmanw hile. WEAR OUR LAPEL PINS TO WORK OR JUST FOR LEISURE, THEY WILL LOOK FANTASTIC ON YOUR TIE OR JACKET COLLAR. ALWAYS WANTED YOUR OWN DESIGN MAKING???. WHATEVER YOUR CHOICE THEY WILL MAKE A GREAT AND FUN ADDITION TO YOUR COLLECTION. 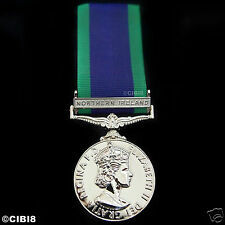 MEDALS - NORTHERN IRELAND GENERAL SERVICE MEDAL. FULL SIZE. FULL SIZE. NORTHERN IRELAND. Reverse : an oak wreath enclosing a crown with the words. Ribbon is deep purple edged with green. This is a stunning full size die struck copy with swivel suspender of the. The buckram is wrapped with navy blue fabric and finished off with black felt on the back. 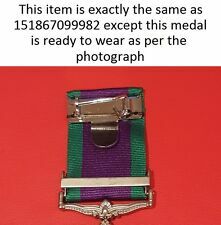 This is a General Service Miniature Medal with Northern Ireland Clasp and Ribbon. The medal size is approx 19mm in diameter. Made in the United Kingdom. This medal is unmounted. We can mount medals and stock most medals. If you have any questions please do not hesitate to contact us. (One of The Best Quality Replica on The Market). Anyone interested in history will love this amazing piece of art! try to resolve any issues or concerns you have experienced.